Sheesh!!!! HE never carries a gun! And here he is, giving a probably loaded weapon to a KID!!! Hey, I know she doesn’t LOOK like a kid, but she is!!! But, then again, all America back then was gun-crazy. No excuse, I know. The writer should have thought twice! Hey, wait a minute. Why’s this guy doing running around with a thirteen year old girl anyway!!!??? Something wrong here. 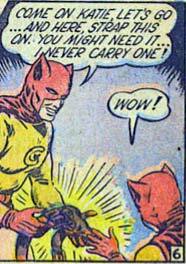 Here I was thinking it was uncommonly sporting of him to actually ARM his teen aged human shield. Unusually egalitarian of him to have a female sidekick. Why would a thirteen year old boy be any better? It took me a long time to realize it was a gun. In general the combination of underage girls named “Kitten”, older men in spandex, and anything called a strap-on is something you aren’t going to want to see.